Frisco's Nordic Center offers a vast network of groomed trails for all levels, all set beneath some of the most beautiful mountains in Colorado. Fees are $20 for an adult day pass, $15 for youth and under 6 years old free. 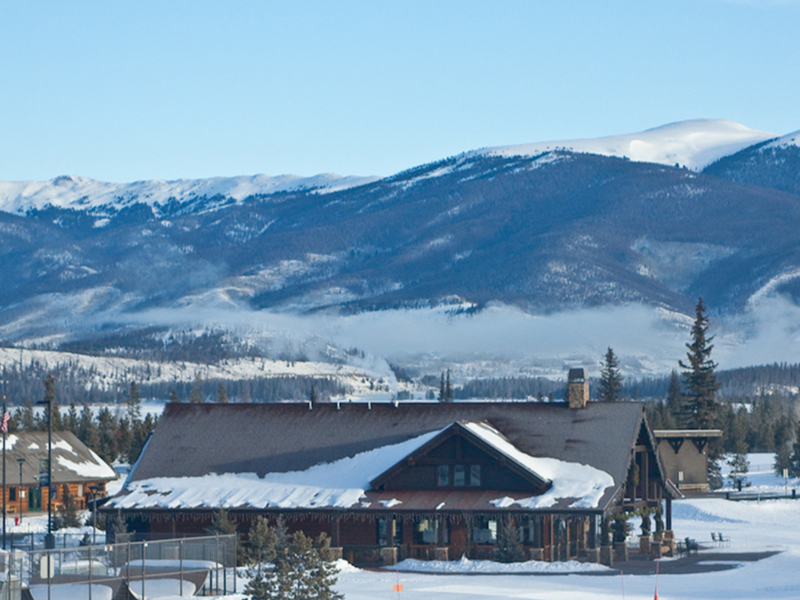 The Frisco Nordic Center is situated on a peninsula in Lake Dillon, just a few minutes’ drive from I-70 (exit 203) and roughly an hour and a half from Boulder or Denver. From the Front Range, Frisco is one of the closest Nordic centers that offers quality, dependable cross country skiing all year long. In fact, the University of Denver ski team can be found training there, just for the afternoon, several times a week. Owned by the Dayton family, the Frisco Nordic Center offers equipment rentals, ski service, some snacks and soup, friendly services and a small selection of clothing, gloves, ski wax and tools. For those who like to work on their own skis, there is a public wax bench located outside of the lodge—it can be cold and windy there, so if you need to do some in-depth ski maintenance, plan on getting it done beforehand. The Nordic Center also has a few corners where you can stash belongings while out skiing but it’s sometimes easier to leave you extra clothing in the car. For beginners, there’s plenty of flat and easy trails right out of the back door. For intermediates, try the Frisco Bay Loop—unless it’s windy. Frisco Bay gets winds that come across Lake Dillon and can lead to trails getting drifted and cold fingers. For advanced skiers, there are plenty of great loops as well… ry Buzzsaw! One thing to be aware of, however, is that some fast sections of trails lead to intersections, so be sure to use caution when crossing trails and descending steep hills.The area isn’t just for skiers, though, featuring snowshoe trails throughout the property and guided tours are available. 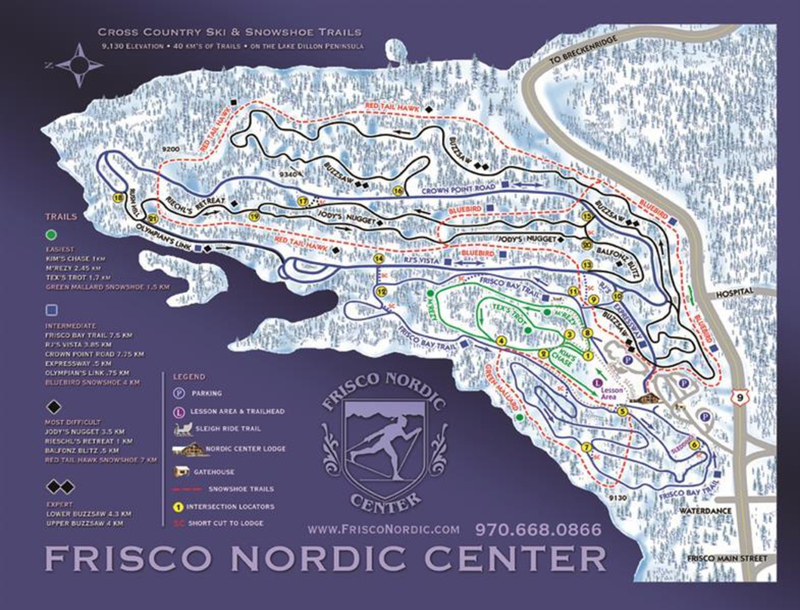 Frisco Nordic Center also offers a number of events throughout the season including both cross country skiing and snowshoe races. Keep an eye out for owner, Gene Dayton, too…he’s been known to pull out his accordion and lederhosen on such occasions! Cross country skiers of all levels who love well-thought out, groomed and scenic trails will love the variety of terrain and well maintained trails. The guided tours are also nice for those who want to cruise and learn a little about the Frisco area. From I-70 Exit 203 Frisco/Breckenridge, take Summit Blvd/Hwy 9 1 mile to the Frisco Adventure Park. Turn left off of Hwy 9 at stoplight onto 616 Recreation Way, Frisco, CO 80443. Across from the Hospital and near the New Tubing Hill. Fees are $20 for an adult day pass, $15 for youth and under 6 years old free. Season passes and senior citizen discounts also available. Please visit the website for further pricing info.